Der VK 72.01 (K) ist ein deutscher premium schwerer Panzer der Stufe 10. 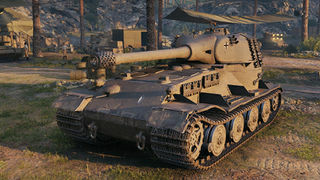 Also known as the "Failowe", the VK 72.01 (K) was awarded to the 3,000 players who amassed the most Fame Points in the Second Clan Wars Campaign. 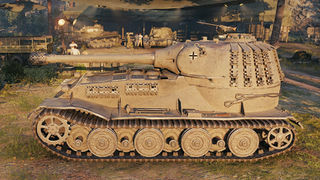 Notable for its unique appearance, the tank is the most mobile of the German tier 10 heavy tanks, and utilizes the E 100's 15 cm Kw.K. L/38. As it is decently fast for a German tier 10 Heavy tank its best to utilize this by claiming a choke point and start sidecraping. This tank is a beast when you minimize your total area that's exposed to enemy fire. 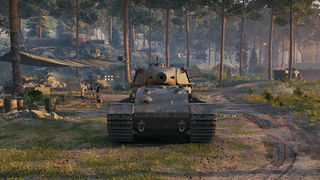 The VK, like many other tier X heavies, does not have good side/rear protection and is as vulnerable as any to flanking; with its slow turret traverse pushing too far ahead can be very dangerous. The VK works best in a defensive capacity or by working in concert with other tanks while pushing down a lane. With an even slower rate of fire than the other 150mm-armed heavy, the E-100, the VK7201 usually will not win a damage-per-minute contest and probably responds best to peek-a-boom style play. The gun depression on the VK is not terrible despite being a rear-turreted tank, and with the excellent turret face, the VK can be quite decent at using slight variations in terrain to create impromptu hull-down fighting locations which relocating between areas of better cover. Contrary to the in-game description, no blueprints of this tank exists, only a wooden mockup. Actual planned turret & hull armor was 100 mm on the front and 80 mm on the sides. The tank's weight is actually 72 tons, hence the name VK 72.01 (K). Diese Seite wurde zuletzt am 25. Oktober 2016 um 14:26 Uhr geändert.